Relay Colorado offers many ways for you to communicate to anyone that has a phone. We have the services you need to never miss a word. 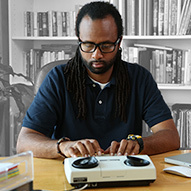 Relay Colorado is a free public service that enables people with hearing or speech loss who use a teletypewriter (TTY) or other assistive device to communicate with standard telephone users. The conversation is relayed between the two parties by a specially trained Relay Colorado Communication Assistant. Relay Colorado is available 24 hours a day 365 days per year. A dark-skinned man with long hair in braids wearing black-rimmed glasses and a black polo shirt. He has a wristwatch and bracelet on his wrists. He is looking at a TTY located on his desk as he types. In the background, in black and white, are bookshelves. A dark-skinned man wearing a royal blue shirt. 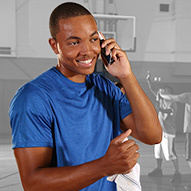 Standing in a gym, he is smiling as he listens to his phone held up to his left ear; his other hand holds a towel. 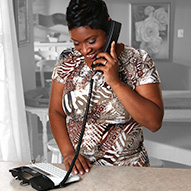 A dark-skinned woman with short brown hair and a jungle-printed shirt smiling as she holds a telephone receiver to her left ear, a wedding band on her finer. She is looking down at a VCO/TTY phone. In the background in black and white is what appears to be a living area. A tan-skinned balding man and black hair who is smiling slightly, wearing a blue button-down shirt and a wristwatch. 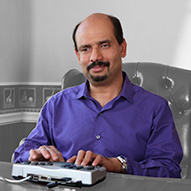 He is typing on a TeleBraille device looking straight ahead of him. A tanned woman with salt-and-pepper hair pulled back into a bun. She has on a yellow short-sleeved shirt, and is smiling as she looks at her tablet, a cup of coffee next to her. In the background is a screenshot of the tablet with conversations on the tablet's screen. A light-skinned woman with long brown hair wearing a light blue blouse, seated in an office chair. 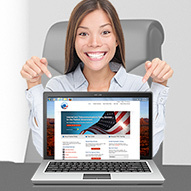 She is smiling broadly into the camera as she points with both hands to a laptop showing the Federal Relay website with the U.S. flag. A tan-skinned man wearing a light purple button-down shirt with a tie. He is holding a smartphone in his right hand, his left hand open as if to point to the phone. 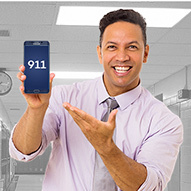 On the phone screen is a blue background with “911” in white text; in the background is an office environment. A tan-skinned woman with long wavy hair and a black blazer over a white shirt. 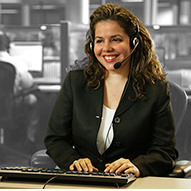 She is wearing a headset, smiling broadly, as she types on a keyboard and looks at a monitor. In the background in faded black and white are other cubicles.